Our private association beach just a short walk away. Family room with a flat screen tv. Study with a pull out couch with a queen air bed. 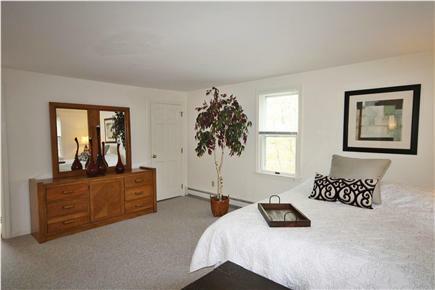 Spacious and bright master bedroom with king bed, ceiling fan. 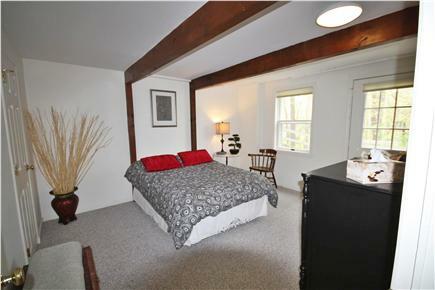 Spacious Ensuite bedroom with king bed complete with ceiling fan. 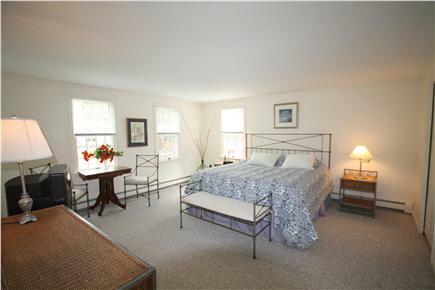 Private access to the patio from this bedroom with a queen bed. 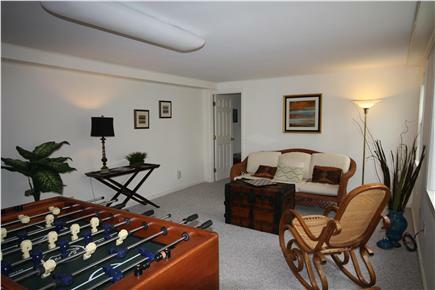 Unwind in the game room with a game of foosball or checkers. 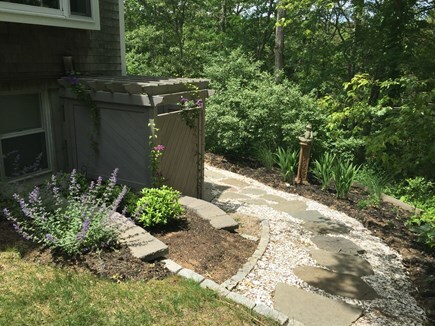 Melt your stress away in our outdoor shower oasis. Begin the day with a lazy stroll to Pleasant Bay to sip your morning coffee or perhaps a picnic breakfast to wake up with the wildlife that abounds; horseshoe crabs, hermit crabs, seagulls and, if you're lucky, perhaps a seal! Perfectly tucked away in South Orleans where the sounds of traffic and the hubbub of tourists are replaced by the singing of a variety of birds in the abutting conservation land, but yet a short drive to explore the many wonders of Orleans. If activity is your passion, look no further than the rail trail that runs right through the center of town where you can rent bikes if you don’t feel like bringing your own. Kayak the many waterways to gain yet another perspective of the beauty that surrounds the area! 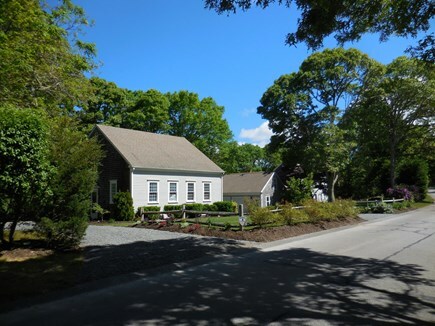 The charms of P-town, Chatham and Wellfleet and many more are a short drive as well. Nauset Beach is just 5.5 miles away if you want the excitement of larger waves or if you feel like indulging in Liam’s famous fried clams, if you don’t feel like digging your own. And then at the end of the day pick up a pizza and scoot to the Bay side in minutes to treat yourself to a sunset dinner and to plan out your next day’s adventures. 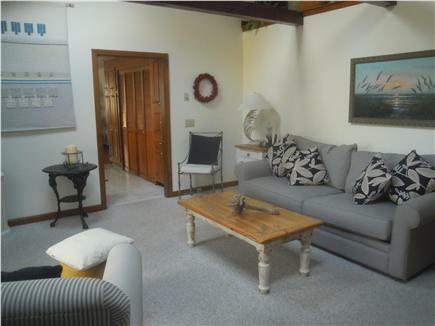 Plenty of room to spread out with the optional rental of the 2 bedroom cottage #20597 on premises which could privately accommodate extended family. We have rented this property for a couple of years now. We use our two weeks on the Cape as an opportunity to regroup as a family. Not only do my four sisters and I have the chance to connect since we live in different states, but the kids (ranging in ages from 16-29) spend time together too. The deck and large living/dining room allow for big family dinners, and the downstairs playroom is perfect additional space. The access to the private bay is wonderful during the day, if people don't want to go to Nauset, but also for cocktails at sunset. The outdoor shower, full bath downstairs and two master suites work really well when you have a number of people trying to shower. And the loft area adds lots of flexible sleeping space. We had a 3 generational vacation this past August. This home and cottage were just ideal! There was plenty of space to get together and plenty of private space for regrouping or napping. Outi was just lovely to deal with and she really cared that we were at home and enjoying ourselves! This house and the garden around it are beautiful, even more attractive in person than in the photos. There is plenty of room for a large group of people to be together and to be apart -- there are two living rooms, one with a tv set and another in the living room/dining room. The dining table seats 10 comfortably and is very attractive. We were three generations, four couples, and three grandchildren, and the space worked very well for us, with one drawback, related to our special needs. 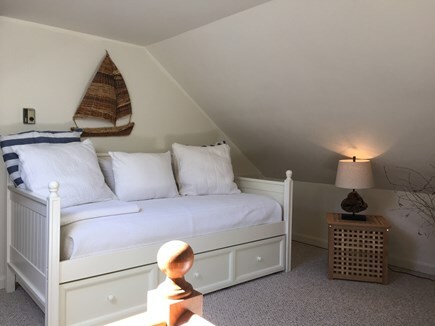 The two couples in the king suites were very comfortable, but two couples (one in the study and one in the lower level off the game room) and the grandkids in the loft, all of whom shared the bathroom on the main floor, found the arrangement a little crowded. The sleeping arrangements were all comfortable, but access to the bathroom was a bit of a logistical problem. We probably should have rented a space with an additional bathroom for our particular group of eleven. But the minor problem of bathroom access aside, we enjoyed our stay here very much. There was a flock of wild turkeys in the neighborhood, who sometimes paraded down the street in front of the house, and one of the turkeys showed up at the back of the house, down the hill, wallowing in the dirt, which turns out to be how wild turkeys groom themselves. We were fascinated! There was a lovely place to sit outside behind the house, enjoying the many beautiful flowers (and some herbs) planted there. One evening our teenage grandson lobbied for a fire in the fire pit and S'mores, which we enjoyed. My son-in-law made good use of the grill on the deck, where we also hung out some mornings. The location was very convenient for us -- not too far from downtown Orleans and not too far from Chatham either. We used Nauset Beach mostly, though a few of us walked to the private beach once and enjoyed it. 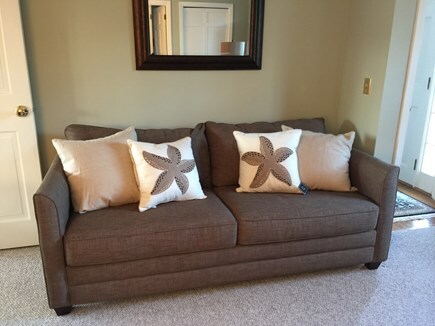 The owner was a delight to work with, friendly and very concerned to accommodate us. The agent who works for them locally was a very pleasant and helpful man -- we called upon him because we found a crib in one of the bedrooms, which we didn't want to use. We had four cars that were easily accommodated by the two-car garage and the large driveway. Because of the need for an additional bathroom (or half-bath), we probably will choose a different setting for our next summer family reunion, but we recommend this house enthusiastically to others. House and amenities were accurately described in the property's write up. I would highly recommend this property to vacationers who have a need to accomdate a sizable family. What a wonderful property! We had plenty of room for two families. The teens and young adults loved the basement sleeping area, while the younger kids loved the loft. 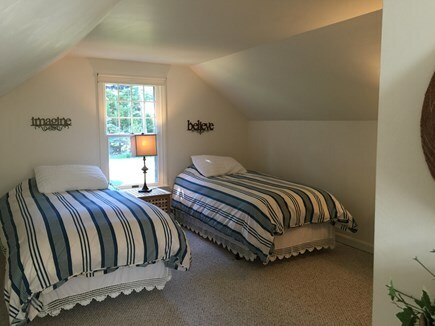 The two master bedrooms with baths gave the adults their own space as well! 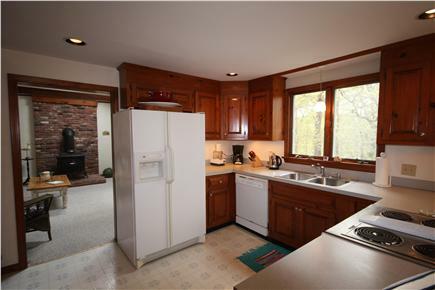 This home had an amazingly stocked kitchen and was very clean and well cared for. We loved that it was a short distance to the National Seashore as well as Skaket Beach on the bay. The owner was also a pleasure to deal with. Our 3 families (6 adults, 5 kids 11-15 years old) had a fantastic week at this very clean, well-equipped and spacious house! We go to the Cape fairly regularly, and Orleans is centrally located - we could go to Truro/Provincetown without it feeling like a slog and it's just a quick hop to more built up Brewster/Harwich if we wanted to. Owners and caretakers were very responsive and made us feel very welcome - Outi even checking in on us from Singapore! The only thing I'd note is that the nearby Pleasant Bay beach is not a swimming beach. The sand area is tiny and is really a boating dock. It's good if you just want to sit by yourself with a good book but not quite so for a big group! Still there are lots of other fantastic beaches and ponds nearby you can drive to! 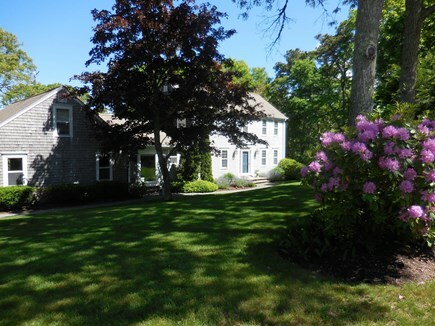 Spent a week at this home and enjoyed the house and Cape. We had our son and daughter and their families with us. Total of 6 adults and 3 boys from 9 to 16. We had plenty of room and a great kitchen to cook in. House had everything we needed. Cape Cod is a great vacation spot but we should have done a bit more planning on what to do, as there is so much it took awhile to find out what we really wanted to do. So many choices. Restaurants in the area were great. 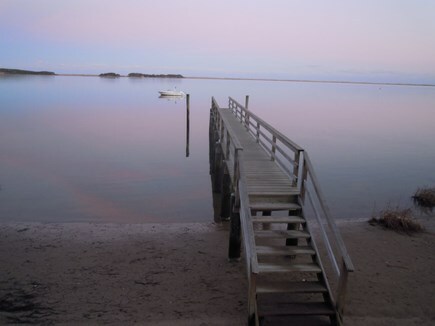 We have been vacationing on Cape Cod for many years and the Orleans/Chatham areas are our favorite. We found this house to be very clean, well equipped, spacious and comfortable. The house was perfect for our family of 13, and the loft was a perfect fit for our teenage granddaughters. 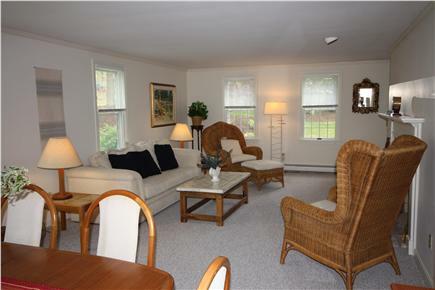 Well equipped and nicely maintained house in a quiet location. Beds were comfortable and furnishings were nice. Nauset Beach is a delight and the town does of good job of maintaining the tennis courts.